* Buy a ticket, light a home. Each ticket sold on 12 July will go towards the purchase of a solar light bulb for an orang asli home. Kuala Lumpur, 15 May 2013 – From the Academy Award-winning film comes an equally acclaimed stage production. The Actors Studio’s RASHOMON, presented by JTI Malaysia in collaboration with The Kuala Lumpur Performing Arts Centre (klpac) and HANDS Percussion, will play for a limited run from 12 to 14 July 2013. The film catapulted Akira Kurosawa to international fame and won the Golden Lion at the Venice Film Award. The Actors Studio’s own adaptation was staged thrice and won Best Lighting Design, Best Original Music, Best Set Design and Best Costume Design at the BOH Cameronian Arts Awards 2003. So famous is this piece of work that a term called the “Rashomon effect” was named after it. In this adaptation, a heinous crime takes place leaving one dead and another traumatised. A yakuza steps forward to claim responsibility and a trial is set in motion. The witnesses are called to testify. The only problem is that each testimony contradicts the other. What really happened on the day of the crime? RASHOMON originated from two short stories written by Ryunosuke Akutagawa almost a century ago. The fact that it was the very work that introduced Kurosawa and Japanese films to the West, that it has survived all these years and that it continues to be studied today is a real mark of Japanese talent and ingenuity. The Actors Studio’s production pays homage to this renowned masterpiece. 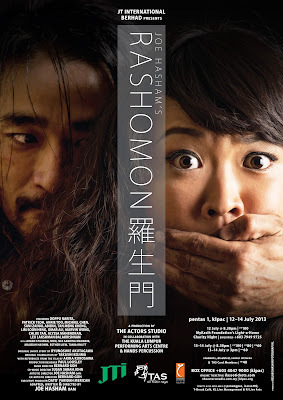 The opening night of RASHOMON in Kuala Lumpur on 12th of July is dedicated to MyKasih Foundation’s Project ‘Light-a-Home’ made possible by JTI Malaysia. For each fundraising ticket sold at RM100, one solar light bulb will be donated to the orang asli community.